When precisely does a book’s backstory begin? Does is start when the author says to herself, I should write a book about this? Does it begin when someone else says to a would-be author, You should write a book about that? (This often happens with non-fiction, by the way.) Or is it earlier? Is it when you come across an interesting idea? A small article in a newspaper – the one you almost didn’t read? Is it at the moment when that little piece of paper you clipped starts to invade your thoughts – unbidden? Is it when the would-be author finally says – not I should write a book – but I want to write this book and I’m going to write it? This issue of the germination of an idea was in the forefront of my mind earlier this week when I pulled my car up in front of the studio/home of a local watercolor artist here in Halifax. A month ago I’d never heard of Laurie Mireau. But since the day that my husband, who had met her about a month ago, came home with a brochure about her artwork, I had been haunted by one of the pieces featured. 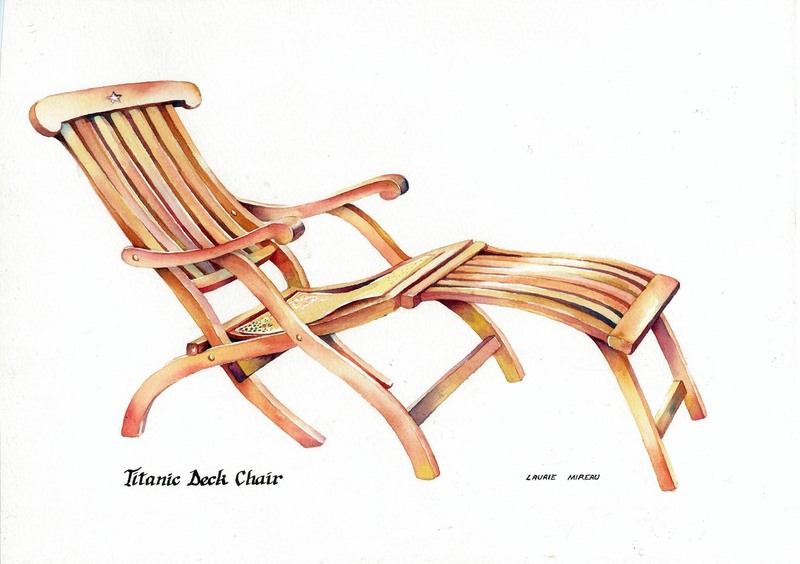 The piece was a stark watercolor painting of a deck chair from the doomed ocean liner – Titanic. Titanic has a strong connection to Halifax. Although the ocean liner went down closer to Newfoundland than to Nova Scotia, a number of the bodies of those who perished here brought to Halifax and are buried in a cemetery in the city. Add onto that the fact that there is a truly fascinating exhibit at the Maritime Museum of the Atlantic and you have a storied port city that is part of the tragedy. But there has always been something iconic about that single deck chair – the real one that is on exhibit at the museum, as well as the replica that is for you to sit in and let your imagination run. You lean back, your head just below the star symbolizing the White Star Line. You close your eyes – and suddenly you’re there, on her deck. You can smell the ocean. You can hear the clicking of heels on the deck – no deck shoes in those days. At least that’s how it is for me. In any case, when I saw that thumbnail of Laurie’s painting, I had to have it. First, I had to find out if she still had the original. I didn’t want a print – only the original would do. So, I contacted her and she managed to find it. 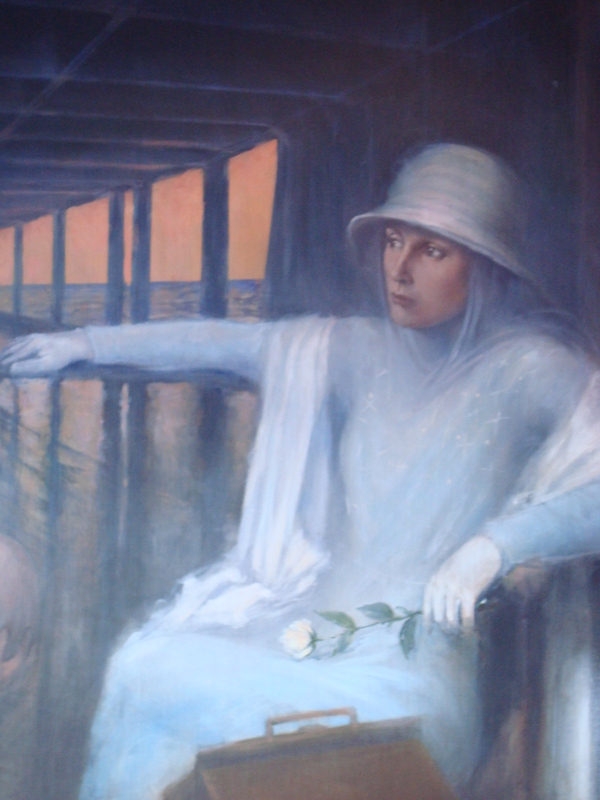 When she asked me about why I was interested, I spewed out an entire story about the deck chair, a painting that I’d seen and photographed on the wall of a bar on a cruise ship a couple of years ago and how I had an idea for a book set in about the 1920’s or ‘30’s – on a transatlantic voyage. (No doubt she thought it was too much information!) To tell you the truth, I didn’t have much of an idea, but it occurred to me that the idea was germinating. I had the distinct feeling that this might just be the beginning of a backstory for a new book that I’d write in the coming years. It doesn’t take much to get my mind rolling. The new book whose cover you looked at in last week’s post all started when I stumbled upon an academic article in an early music journal calling into question the widely-held belief that St. Hildegard of Bingen, a 12th century Catholic mystic, writer, healer, composer actually knew enough about music to compose the 77 songs attributed to her. I started thinking: if she didn’t, then who might have? Previous What’s in a book cover? (Part 2): The Whole Damn Thing!